viaLibri ~ DOGS: THEIR HISTORY AND DEVELOPMENT. DOGS: THEIR HISTORY AND DEVELOPMENT. Boston: Houghton Mifflin Co. N.d. (circa 1927). n. 1/2 cloth. Near Fine. Lg. 4to. 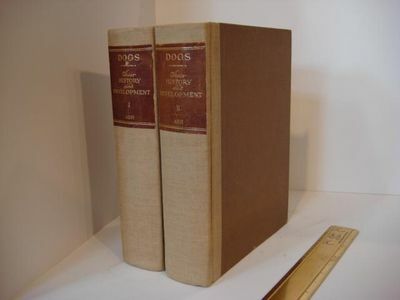 2 vols. xviii,384; xvi,(385)-778pp. plus 162 plates. Index. Additionally illustrated with numerous text figures. Tan linen over brown boards, brown morocco spine labels (a bit rubbed), cloth is very clean. Mostly unopened. Occasional light text foxing.